Since Early 2000, when this film was released in the US & Canada, many movie theaters started to display posters advertising the movie. Here are some examples. At top left is the first movie poster for the film, which was displayed in Spring & Summer 2000. 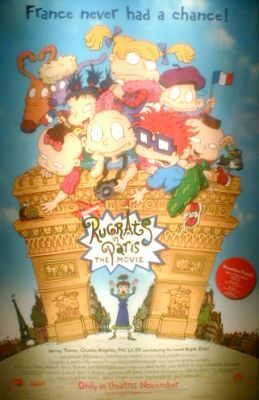 This poster is, more or less, a teaser poster with only the current Rugrats, larger than life on top of the Eiffel Tower. To see a larger picture, click here. 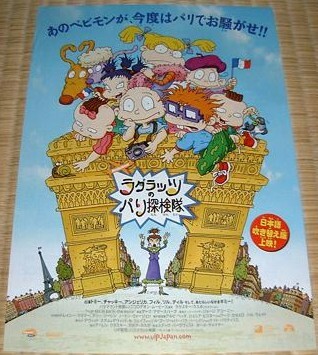 At right is the current poster, released around September 2000 and featuring Fifi, Kimi and the other Rugrats, all larger-than-life, on top of the Arc de Triomphe. 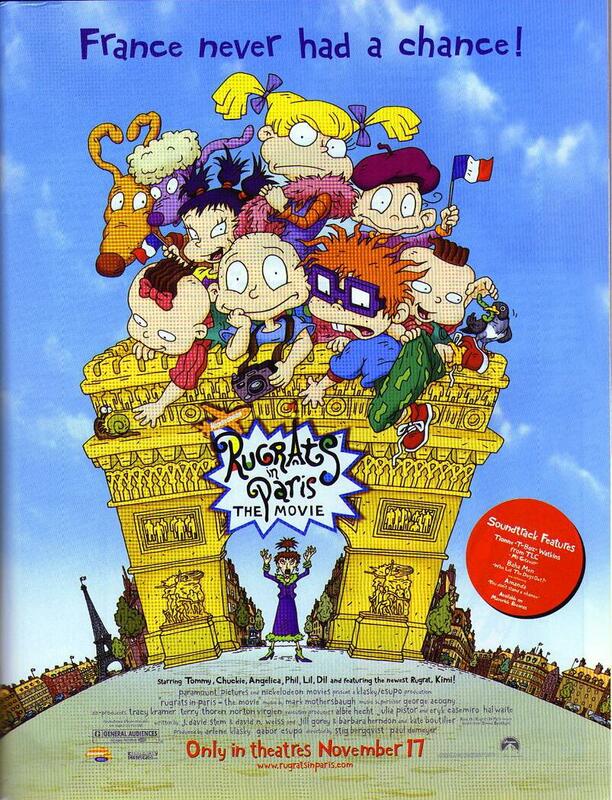 In the center of the Arc is Coco LaBouche, the Rugrats' enemy. The big red dot on the right side has information on the soundtrack. To see a larger picture, click here. At bottom left is another poster, similar to design as the poster on the right, but stressing the fact that group sales for the film are available. 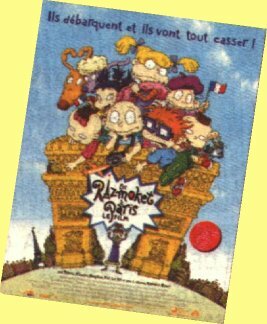 In the US & Canada, most retaillers that sold the Rugrats In Paris video placed them in special display stands, provided to them by Paramount. The display is similar to the Eiffel Tower poster above, though the side panels look like the image at left. 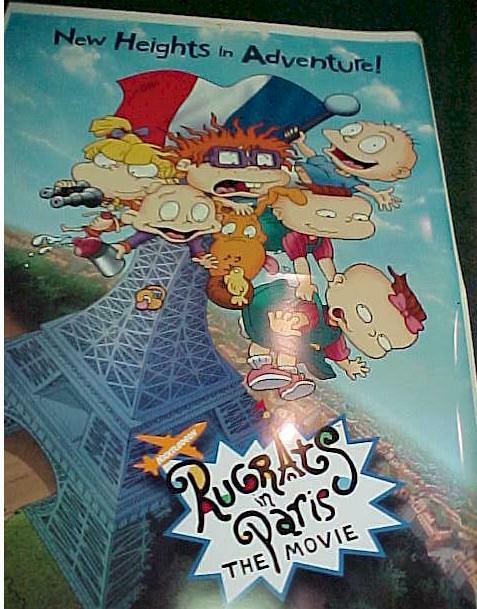 Posters for the film started going up in Britain in mid-December 2000, about 4 months before its British release.One example is this small poster, about 12in.X 16in. in dimension. Apart from the layout design for the "double-wide" effect, the poster's practically the same as in the US, except for the inclusion of the UIP logo. For a larger picture, click here. Newer versions have a small "U" next to the logo, symbolising that the film was certified, or rated, "U" (all ages) by the BBFC (British Board of Film Classification). The German version of the poster, found at theaters in Germany, Austria & Switzerland, have the tag line, "Da wackelt der Eiffelturm! 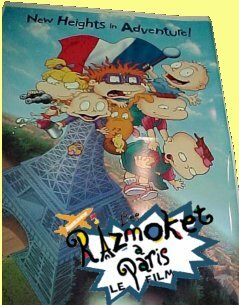 ", meaning "They're shaking the Eiffel Tower!". However, as you can see here, the babies are on the Arc de Triomphe. The Spanish version of this poster says, "¡Francia nunca imaginó lo que sucedería! ", meaning "France never imagined to succeed", or, roughly, "France never had a chance". This poster is for the Japanese release for the film on 4/20/2002. For more on the Japanese version, click here.